The iPhone seems ready to turn into the hottest kitchen accessory since the food processor. (CNN) -- The last few centuries of kitchen innovation have given us indoor plumbing, refrigeration, microwave ovens and the Slap Chop. But one piece of kitchen equipment hasn't changed much: the cookbook. In terms of format, the earliest known cookbook ­ -- De Re Coquinaria, written in 4th century Rome ­-- isn't all that different from Rachael Ray's latest collection. But now, everyone seems to be saying print is going the way of the Roman Empire. Compared to the rest of the publishing industry, the cookbook market is holding up relatively well, but the iPhone era may finally bring some innovation into a very old genre. Digital devices are entering the kitchen, and they're changing the idea of what a cookbook can do. There are more than 85 million iPhone and iPod Touch users around the world; since the iPad was launched in early April, more than a million have been sold. Four billion applications have been downloaded from Apple's iTunes store, and among the most popular are cooking apps. 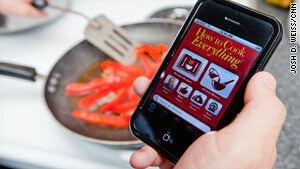 The iPhone and other portable devices seem ready to turn into the hottest kitchen accessory since the food processor. A lot of that might be because of high-tech digital cookbooks that can do much more than gravy-stained hardcovers ever could: making shopping lists, sharing recipes with friends, helping to use leftovers efficiently, figuring out, instantly, what words like "julienne" mean. The award-winning food website epicurious.com, owned by the Condé Nast magazine group, introduced its free iPhone application a year ago. By November, it had been downloaded a million times. The moment the iPad hit the street, Epicurious had a slick, large-format version of the app ready to go. Its biggest attraction is a curated database of professional recipes: 28,000 of them, from the pages of Bon Appetit magazine and the now-defunct (and much-missed by foodies) Gourmet. Like the Epicurious website, the application makes this impressive archive easy to handle by providing a bunch of different ways to browse: by ingredient, by season, by occasion. Users can also search by keyword, and filter searches according to what ingredients are on hand. They can also create an interactive shopping list. Even more popular than Epicurious on the app front is BigOven, which has been downloaded more than 2 million times. The iPhone version is free, but there is a more elaborate Pro app for the iPad for $9.99. The heart of BigOven is a user-generated collection of more than 170,000 recipes: more than an entire library of cookbooks. Like all crowd-sourced collections, there's no guarantee they'll all be good, but users can rate and comment on recipes, which helps zero in on the best in the bunch. The application also comes with quite a few other bells and whistles: a glossary, a tool to convert recipe measurements to metric and a widget that suggests recipes using forlorn leftovers in the fridge. For those who want to introduce an element of chance into the kitchen, the website allrecipes.com has its own iPhone app, the Dinner Spinner. While thousands of user-submitted recipes can be searched in a variety of ways, users can also shake their phone to get a random selection of dishes: cookbook as slot machine. Celebrity chefs have just started moving into the app world, releasing versions of their most popular books in digital form. Name-brand cooking apps are likely to become the hot new market. Jamie Oliver's 20 Minute Meals ($4.99) has gotten great reviews for its spiffy design and entertaining video clips. Just released, the Nigella Lawson Quick Collection ($7.99) has become an instant best-seller. It includes a voice activated feature, so cooks don't risk getting goop on their pristine touchscreen. Also getting high marks from foodies is the brand-new iPhone version of Mark Bittman's incredibly thorough volume How to Cook Everything ($1.99, on sale). While it includes a shopping list tool, perhaps its greatest asset is the fact that home cooks no longer need to lug the hefty, 1,000-plus page volume around. Media-savvy kitchen stars Martha Stewart (99 cents) and Tyler Florence ($4.99) are also trying to get into the action. Expect more to follow them into the portable world in the coming months. It's not just recipe collections that people are downloading. There are a bunch of innovative stand-alone apps designed to make preparing meals more efficient. FoodScanner (99 cents) is one of several apps that use the iPhone's camera as a bar code reader. Point the phone at a food package and it will give nutritional information and track daily calorie counts. The free Grocery IQ app (recently taken over by coupons.com) also lets users scan labels, and includes features to organize shopping lists. Do you put the roast into the oven before or after you start peeling the potatoes? For cooks who need help organizing their time, Mise en Place ($2.99) is a kitchen project management tool. It can break a multicourse meal up into discrete tasks and lays out a schedule so users know what to do when. If conscientious eaters want to get back in touch with the rhythms of agriculture, they can whip out their iPhone. Locavore, ($2.99) which made it onto Time magazine's 2009 list of the Top 10 iPhone apps, uses GPS to figure out where the phone is, then lists what's in season in the area and provides maps to local farmers markets. But what if all this elaborate food preparation is seeming like too much? Just make a boiled egg. Egger (99 cents) will make sure it's the best boiled egg it can be: Enter egg size, preferred softness, and get a custom timer. Or, just Order Pizza . Why aren't robots doing my dishes yet?